Mahabalipuram is also known as Mamallapuram, is the place situated in the center of the state of Tamil Nadu. It was the capital of the Pallava’s kings. This World Heritage site was a seaport in its early days. The place was being known for great carving and temples at sunset when the sandstone turns into bonfire orange and blood red. It is an attractive and memorable place, having tradition, holiness, history, western archives and modern importance. Mahabalipuram is also known as the temple city of Tamil Nadu. There are eleven excavated temples which are identified as Mandapas. This Mandapas is also said as two open air bas relief. There is one more temple which is a cut out temple called as “Ratha”. There are five Ratha Temple and one Shore temple also which is most famous. Shore temple is one of the glorious rocks cut sophistication standing and overlooking towards the sea. 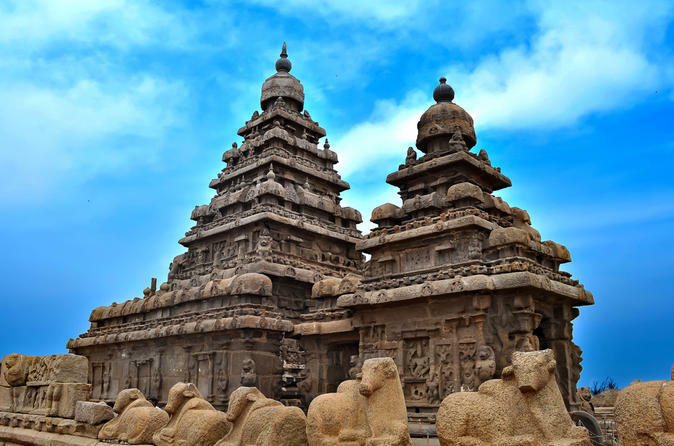 It symbolizes the heights of Pallava’s structural design and the naval ambitions of the Pallava kings. Five Rathas are fixed from solo pieces of rock and low laying monoliths. Each temple is dedicated to a Hindu God and named on one of the Pandavas. On the entrance of each Rathas there is a figure of an animal mount of the God. The first Ratha is on the name of Draupadi. It is also dedicated to the Goddess Durga who looks out at her people attending worship from as carved lotus throne while outside a huge sculptured lion stands as a guard. Behind the shrine of the Goddess there is a huge Nandi, who is the bull or vehicle of Lord Shiva. Second Ratha is Arjuna Ratha which dedicated to Lord Shiva. After that, the other Ratha is Bhima Ratha. After that is Dharmaraja Ratha dedicated to the Lord Narasimhavarman and the final is in the name of Nakula-Sahadeva Ratha which is dedicated to the Lord Indra and has a fine sculpture elephant standing nearby. There are other temples also which makes the visit memorable for visitors. It is situated in the state of Tamil Nadu; therefore the nearest airport is Chennai. 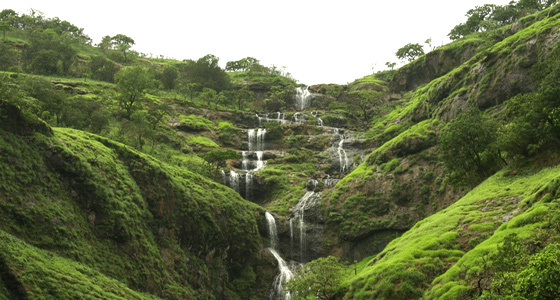 It is connected by all the major states of India by numerous flights. International flights operate from various parts of the world to Chennai. The nearest railhead to the Mahabalipuram is Chengalpattu and Chennai. There are many trains to and from the destination. There are many bus facilities also provided by many travel agents. You can book your cheap flights online from any flight booking portal and cheap air tickets are also available with many air ticket booking agents. Mumbai or erstwhile Bombay is a city alive with the rhythm of life. Mumbai is a world hub of culture, music, and film. Where better to capture the spirit of thriving Mumbai than in the home of music – Hard Rock Cafe. India’s very first Hard Rock Cafe, the Hard Rock Cafe Mumbai Worli is the ideal venue for a night out with friends or family.Hard Rock Cafe ia a chain of theme restaurant with Restaurants, Music memorabilia ,Casinos and hotels . HRC as fans would like to call it, boasts the best music-gigs, rock-centric ambiance, handcrafted drinks, legendary burgers and also local flavors! If these walls could talk, they would whisper legends of rock and roll heroes and guitar phenomenons.Embellished with set pieces from world-famous musicians like Elvis Presley, Madonna, Bruce Springsteen, and Led Zeppelin.With a backing band featuring some of India’s finest musicians tracks in karaoke style , rock to retro will make you enjoy to the fullest. The game is always on at Hard Rock Casinos. Come try your hand on thrilling tables including blackjack, baccarat and poker. Or tap into thousands of the hottest slots on the planet, from the latest to the greatest hits. When you’re playing all your favorites, surrounded by the world’s greatest rock memorabilia collection you’ll get it. Hard Rock is the only place to come out and play.Between games, grab a drink and check out some live, world-class entertainment..Just about anything can happen at Hard Rock Casinos. You might catch your biggest winning streak ever. Or you might get really lucky and find yourself in the front row, watching your favorite band. No matter if you’d like to roll the dice, dine or rock the night away, get here. And get your game face on. When you work up an appetite, HRC feature menus fit for a VIP.Fill your platters with multitude of dishes like American, Continental, International, Mexican . You can dine in and rock out, right here. There’s a piece of the music for everybody, no matter what you like. Poompuhar also known as ‘kaveripoompattinam’ the Port town of Chozha Empire and the last well known king who ruled there was the Greate Karikala Chola. 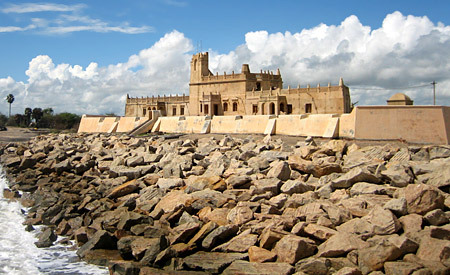 Poompuhar is a town for those who like to wander amidst history and take a stroll through time. Poompuhar is renowned for its handmade items.Numerous collections for handicrafts lovers – Bronze art plate, brass lamps, brass miniatures, wood carvings, sandalwood products, wooden lacquer-ware, Thanjavur paintings, palm leaf products, Korai mats, batik prints, Kalamkari prints, applique work, stone carvings, cane products, Thanjavur garlands, papier mache, clay and plaster of paris products, pith products, musical instruments, Thanjavur cut glass and miscellaneous handicrafts. there are lot of places to hang around. poompuhar beach :the river kaveri merging with billowing sea .the blue expanse of water and filled with tranquillity that gives you a peace of mind away from the hustle bustle of the city life. The beach has black sand which makes it look stunning. The beach also houses Silappathikara Art Gallery ,is a beautiful seven-tiered building of great sculptural value. Scenes from Silappathikaram, the Epic of the land have been given lively shapes in stones on the walls of the Gallery. Zion Church: Built in 1792, this church reflects the rich Christian heritage of Poompuhar and is popular for its architecture. Town Gateway: Reflecting a very prominent Danish architectural influence this structure was built in 1792. Danish Fort: Today controlled by the Tamilnadu Archaeological Department, this Fort was built in 1620 and is visited by countless tourists each year due to the Archeological Museum which it houses. Masilamani Nathar Koil: Though heavily eroded by the sea in a number of places, this temple built in 1305 by Maravarma Kulasekara Pandiyan, still manages to impress all the tourists to Poompuhar with its architectural richness. Danish Governor Bungalow: Used as the residence of the Dansih Governor in 1784, this impressive buildings today controlled by the Tamil Nadu Tourism Department. Poompuhar, being a coastal area, experiences a hot and humid climate for most of the year. Summers get extremely hot, but the winter season which is from December to February has a cooler climate than the rest of the year. This is the best time to visit Poompuhar.